In his native country of Mexico, Mr. Gonzalez worked in the Federal Government as an intern at the Presidency of the Republic and agent at the Attorney General’s Office. Those experiences awakened his passion for human rights. After establishing his residency in Texas, and working for several years in business development, he resumed his academic career at Southern Methodist University (SMU), where he earned a master’s degree in human rights with a focus on two main components: the Holocaust and genocide, and Latin American state sponsored violence. 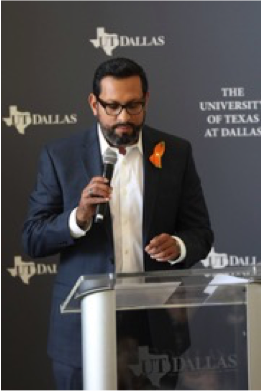 He is currently a doctoral candidate in the History of Ideas program at the University of Texas at Dallas (UTD), and works as a research assistant for the Center for U.S.-Latin America Initiatives. He is working on his Certification of Holocaust Studies at UTD’s Ackerman Center for Holocaust Studies, where he also collaborates as the liaison-academic advisor who established contact and agreements with museums and academic institutions in Mexico City, Guatemala City, Paris, and the Meritorious University of Puebla, Mexico (BUAP). Mr. Gonzalez has a long record of participation in human rights. He has been a panelist at the 17th World Congress of Jewish Studies in Jerusalem, Israel, as well as multiple events at UTD. He is currently completing his dissertation on racism and nation-state building in the nineteenth century.